Yesterday I set multiple alarms for five o'clock this morning and yet still managed to wake up five minutes before they went off. I've heard that many people have this ability or whatever it might be called, but almost no matter what time I set the alarm, I always wake up just before it goes off. I'd love to understand this one day. Anyway, I was up early as we had some more work to do at the summit, it was the last chance to take some measurements we need before work starts in earnest on Monday. The idea was to start early and get off early, as it's already been a very long week. This had the advantage of arriving at Vacation Resort Hale Pohaku in time for a fantastically unhealthy breakfast but a gorgeous one nevertheless - they are known for their wonderful breakfasts! Eggs over easy, bacon, sausage links and hash browns today. Mmm! After filling up with cholesterol we leave HP at around 8am in our 4-WD vehicle and have to stop almost immediately. It's time to change from 2-WD to 4-WD low gear ratio. 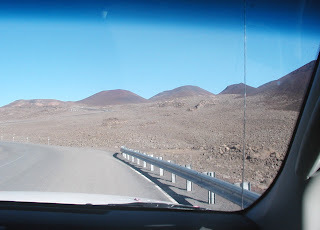 The next few miles are on a steep dirt road that has thrown many people to their deaths, so we have to be careful. I'm co-pilot for the trip which allows me to take a few blurry pictures on the way to 14,000 feet rather than fight the steering wheel. After a mile a two we're treated to a wonderful view of the saddle between Mauna Kea and Mauna Loa and as usual the clouds are drifting in from the east. It was raining when I left home and it was still raining when we left Hilo, and for most of the drive up the Saddle Road it was drizzling and misty. At this altitude though, about 10,000 feet, we're above the clouds and it's hard to imagine the conditions we've left behind. Unfortunately I'm not allowed to open the car's passenger window, it would allow too much dust into the car, and coupled with an early morning sun and the bumpy road, it makes it impossible to take a nice picture, this is the best I could do. 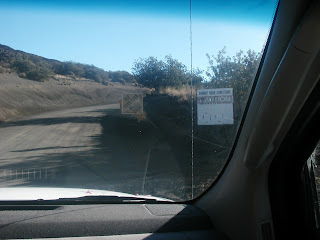 About three to four miles above HP we drive past this sign. It's in the wrong place, only an idiot would decide to go off-roading here. There are places further up that look inviting for an off-road trip and there are no signs there. Even the road itself is becoming increasingly bumpy and I'm surprised this picture came out. On either side of us the terrain is becoming increasingly steeper and the drop to the left is something one doesn't contemplate. Now the drive is just nasty. Both the driver and I are being thrown around and I'm hanging onto the passenger's handle to stop my head banging into the vehicle's interior - and we're only driving at 10-mph. I take a picture holding the camera in my other hand because the summit is now in view, it's there in the centre of the picture. A few more miles to go yet but a smoother ride is almost upon us. 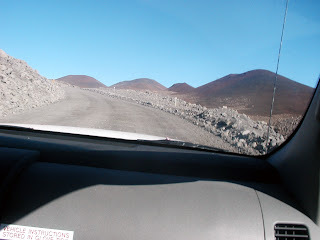 The good news is that even if we went off the road at this point we no longer face rolling the car hundreds of feet down the side of the mountain - and someone might even find us if we did! Time to stop and go back into 2-WD. The summit stays in sight for quite a while now but the observatories can't be seen - the last time we saw them was on the Saddle Road over an hour ago. 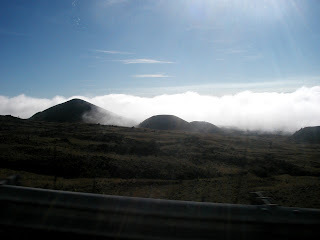 They're hidden behind the cinder cones. This is also the point where I can't stop thinking about all those images from Mars and how similar they are to Mauna Kea's terrain. Generally, pictures from Mars don't have tyre tracks on them although there are images from Spirit and Opportunity that show their own tracks. 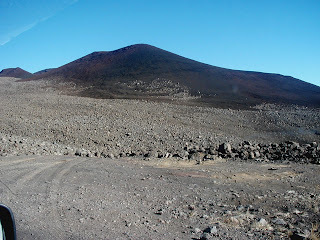 Most people that visit Mauna Kea's summit area can't help commenting on how similar the place looks to Mars, and I agree. It's only when you pass all the observatory and tourist traffic that you remember you're still on planet Earth. It's either that or the effect of the altitude. We're at 13,000 feet now and after negotiating one of the steepest slopes and sharpest bend on the way up the observatories suddenly come into view. Although I've never taken one of the tourist tours to the summit I imagine this is the point that everyone in those vans suddenly gasps. After seeing nothing but red lava rock for several miles and some amazing views of the island, the out-of-this-world summit area appears. You know you're back in civilisation, but just what kind? These aren't normal buildings and many visitors really do say it feels as though they've suddenly been transported to another planet. As for us, the work day is about to begin. Taken from inside a fast-moving truck during the commute this morning. 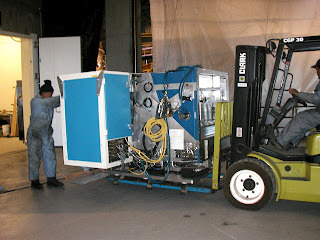 This is what we use to shoot down the alien spacecraft at night, but don't tell anyone. This blog will be a little quieter over the next few weeks as we work on updating one of the most successful ground-based astronomical instruments in the last couple of decades. The picture above isn't related at all to the work incidentally, it was taken a while back when I was working on another instrument project in another time and space, but I like putting pictures in my blog. These are always enjoyable times for me, I love this type of work, but the enjoyment is always laced with frustration and exhaustion. As I mentioned in "Winter's first snowfall? ", my night-time schedule has been replaced with a daytime one. I leave home and arrive back in darkness and spend the day battling altitude-induced brain fade while trying to get the instrument to work again. There are one or two other projects that are more easily done at the summit, so I'm working on those as well. Yesterday was one of the most frustrating days I've ever experienced at the summit. 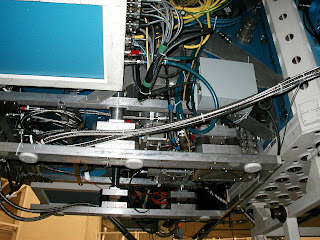 We needed to configure the instrument using its old and dated control software and computers and nothing we did would make it work. I've worked with this instrument for 12 years (17 if you include using it as a student) and know all its foibles, but we didn't even get far enough to experience those again. Nothing we did fixed the problem. Finally, this afternoon, after cleaning up all the torn-out hair, we got it to work. Yes! Now we get to take data for a couple of days before reconfiguring the damn thing to work with the new control software and computers. I can't wait to find out what's in store for us. Really. Oh, and it did indeed snow at the weekend. It melted as soon as the sun came up though. How to annoy cats. OK, one of them. 6:30am a couple of days ago. 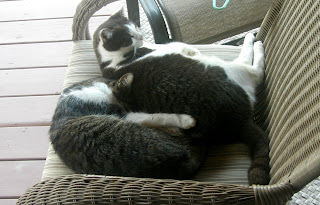 I think they were tired after a long night patrolling the yard, but they don't have a day job so I woke them up - well, one of them anyway. She wasn't in a good mood. A mini-flood of overnight email, more exchanges at 7am while trying to wake-up, two crises meetings, the regular observatory work and an impromptu tutorial made today one of those that make you want to tear your hair out, but on the other hand, one of those that I love. It certainly focuses the mind and I got into troubleshooting mode, which is one of my very few talents. Last week I had planned to have a meeting with one of our engineer-technicians but it was postponed due to a flu-like bug I picked up. So we had it today instead. The meeting was the sole idea of the engineer, he wanted to learn more about what astronomers actually do with the telescope and instrumentation that he and his colleagues spend so much time maintaining and fixing. What an excellent idea! I was more than happy to oblige. So I booked our conference room because even though I only expected this one person to be there, perhaps with one other, it has multi-media capability so it's easier to present images and the various technical web-pages I had in mind. Of course I didn't prepare anything. Why should I? It would be a question and answer session with a couple of curious engineers at most. So at 10am, after I'd spent a few minutes trying to get my laptop to work with the projector, I'm suddenly in a state of shock as I see nearly all our engineers and technicians walk into the conference room. Oh no! Some of these guys know a lot more about the telescope and instruments than I do. They may not know much about the astronomy, but now I have to make sure I don't embarrass myself about how the instruments work and why they're designed the way they are. They know this already! I think the ad lib tutorial went OK in the end but I was sweating. Thinking on your feet is one thing, doing it in front of so many colleagues is another! Only one person left halfway through and that's OK, I told them they could if they wanted to and was actually surprised that nearly everyone saw it through - and some even stayed afterwards to ask some difficult questions! I hope they learned a little about what astronomers do. I also learned something about woofers and tweeters that I never knew before, so at least one person came out with a little more knowledge than before. This was such an admirable idea though and I was more than happy to oblige - these are the guys that keep the observatory running and despite that are rarely acknowledged. If there's anything I can do to help them I'll do so because they deserve it. This is a summary of the next few days' weather expected at the Mauna Kea summit provided by the clever folk at the MKWC. It doesn't look promising. 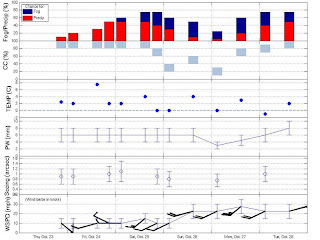 The red bars at the top are bad news for astronomers and combined with the predicted temperatures we might get our first snow of the winter after the weekend. At least the telescope operators might be able to catch up on some sleep. There are always good sides to everything. If it does snow we're prepared as ever - the studded tyres are on our 4-wheel drives and snow chains are always available if needed. 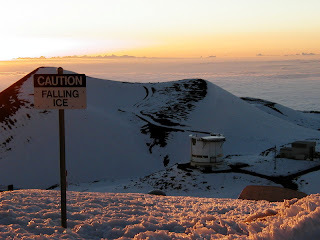 It shouldn't be too bad though, the snow and ice generally melts quickly at this time of year, but the next few months are when Mauna Kea often experiences severe weather. My night-time schedule is non-existent for the next six weeks, but I'll be up during the day working on an instrument upgrade project. It's a tight schedule and bad weather could be disastrous to the plan, so I hope this isn't a sign of what's to come. In the meantime, Hilo just keeps plodding along, the next five days are expected to be: "mostly cloudy", "intervals of clouds and sunshine with a shower in spots", "intervals of clouds and sun with a shower in the area", "times of sun and clouds with a shower in places" and finally "times of clouds and sun with a stray shower". There was the most beautiful sunset here this evening. I even went out onto my roof to photograph it because that's the only place I can get a completely clear view of the Mauna Kea summit from home. It looked absolutely stunning. Unfortunately, I left it just a few minutes too late - I had to see how the first game in the MLB World Series finished first! 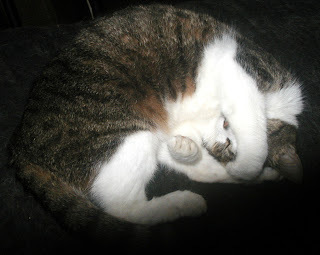 So I found out my camera just couldn't cope, and no matter what setting I tried all the pictures were rubbish. Just not quite enough light. Anyone with some advice for a replacement? I don't have the time (or money) to learn how to become a good photographer, so a DSLR will probably be a waste of money. I've got my eye on a Panasonic Lumix DMC-FZ28K which I think I could get for well under $300 and all the reviews I've seen are quite positive. Advice would be more than welcome. A group from the Association of Canadian Universities for Research in Astronomy and the California Institute of Technology have been doing the rounds recently on the Big Island. There have been several meetings and presentations with the local population encouraged to attend. The "public scope" meetings are for discussion of the proposed Thirty Meter Telescope (TMT). The TMT will be the largest optical telescope in the world when built with a mirror three times the size of the current largest telescopes. I don't know if it will revolutionise observational astronomy, there are still plenty of new things to discover using the existing smaller telescopes, but it will certainly allow observations of the faintest astronomical objects and we'll learn a lot more about the early universe among many other things. 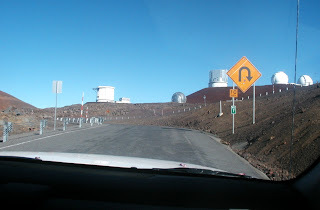 As to where the telescope will go, the decision seems to be between two of the best astronomical sites in the world, Mauna Kea in Hawai`i and Cerro Armazones in Chile. There are likely several scientific arguments for either site, but putting that aside for the moment, the proposal for building the telescope on Mauna Kea has been controversial to say the least; according to colleagues who have been able to attend the public scope meetings, there is a lot of strongly-felt local opposition to the project. I just read a blog in the local rag (*) where the comments were, what shall I say, somewhat outspoken. The main reason behind the opposition to building on Mauna Kea appears to be cultural with some environmental concerns as well. 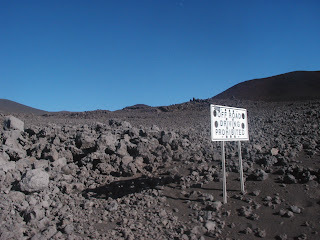 Many Hawai`ians consider the summit a burial ground and therefore sacred, and they are already upset about the number of observatories on the summit, so constructing another, massive observatory is simply unacceptable to them. I hope there is room for compromise, because I don't think there's any doubt that the TMT will be a great benefit to the island. Construction alone will take seven years and provide employment for local companies. The observatory will require a significant local workforce to run successfully (just like the other telescopes on the summit). There appears to be an opinion among many locals that the observatories employ only people from the mainland and abroad, but this simply isn't true. Most of the observatories' employees are locals - and well-payed ones at that. I hope people won't be too shortsighted (nearsighted for my American friends!). The economy is in a mess and Hawaii's biggest industry, tourism, is tanking with drops in tourist rates of 20% or more compared to last year. People are going to become unemployed, there's no way of avoiding that. We've already lost a famous airline within the islands, Aloha, and it will likely get worse. Restaurants are closing, hotels can't fill their rooms and there's even talk of hospitals going bankrupt. The TMT is a gift horse, let's try and find a way to actually make it happen in Hawai`i. (*) Apologies, I think registration is required. I've had enough with all the depressing news about the world's banking system melt-down and seeing my own pension vanish down the drain. So I've hired my own team and they're currently in a head-to-head meeting. They can't do anything worse, can they? While in the slow process of turning into an American I promised myself to spend more time on the mainland visiting and learning about the country. Unfortunately, due to the increase in the cost of everything, I haven't kept that promise, although I did manage one trip about 3 years ago. Don't get me wrong, I've visited the mainland several times, but usually for work-related reasons or overnight layovers at airport hotels. It's rare I get to spend some vacation time there though. That trip was to Flagstaff, Arizona, and although it was short, it was unforgettable. 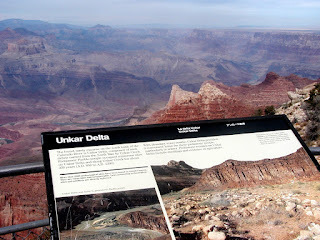 I visited Meteor Crater which although impressive left me feeling a little less than satisfied. I'm not sure why, perhaps I was expecting something bigger, but I'm still glad I can say I've seen it. By the way, why isn't it called Meteorite Crater? 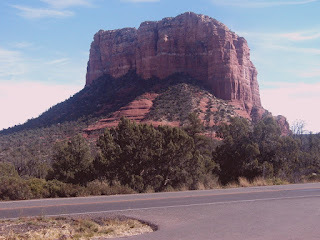 Then there was the beautiful Sedona area and I really felt I was in cowboy country, all the memories of watching John Wayne westerns as a kid came flooding back! 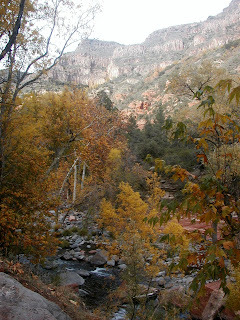 The picture above was taken on the drive from Flagstaff to Sedona City (it was autumn, so the colours were amazing) and the one below is of Courthouse Butte, at least I think it is. Sedona City itself was a bit too much of a tourist-trap for me, but it had a great Mexican restaurant! 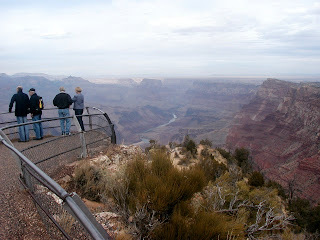 The highlight of the trip is in no doubt; it was the Grand Canyon. My pictures aren't too good I'm afraid, a bad photographer coupled with a hazy day is a bad combination, but I don't think it matters. There's just no way you can capture the sense of awe you experience when you first see the canyon. It's indescribable; breathtaking doesn't even come close. For anyone who hasn't had the chance to see it first hand, make it your life's ambition. On the last day in Flagstaff I took it upon myself to visit the Lowell Observatory. It was a bit of a busman's holiday but it is an historic site. For those without too much knowledge of the history of astronomy, or just astronomy itself, Percival Lowell was the man that pushed the theory of the canals on Mars more than anyone else by observing the planet and presenting his sketches around the turn of the 20th century. He thought he could see canals built by Martians as did many others although there was certainly sceptism at the time, and the observations were not repeatable by any means. In the early 1900s it was discovered that Mars was very dry and the canal/Martian theory started to fall out of favour, but it wasn't until 1965 with the arrival of NASA's Mariner 4 probe that the final nail was put into the coffin. It showed that the surface was barren and was incapable of sustaining intelligent life. 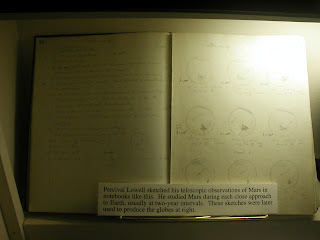 Lowell's observations and sketches are part of astronomical history and are displayed at the Lowell observatory. I felt privileged to see them. The observatory is historic for another reason. It's where Clyde Tombaugh discovered Pluto in 1930. Although that story deserves more than just a few sentences, the observations of the solar system's outer planets indicated that there was a discrepancy that had to be caused by another planet beyond them and the calculations showed where it should be. After some extremely painstaking observations Tombaugh discovered the planet, or at least he thought so. Although Pluto was certainly real, it was a serendipitous discovery. Tombaugh just happened to discover what is now known as a dwarf planet after us evil astronomers demoted Pluto from planet status in 2006. In fact, the discovery of Pluto's moon, Charon, in 1978, showed that Pluto didn't have the mass to affect the outer planets and soon afterwards data from the Voyager 2 probe showed that there was no discrepancy to start with. 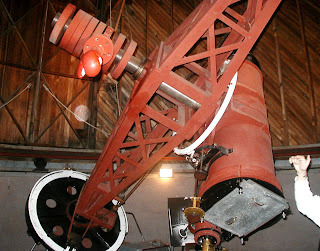 This is the telescope Tombaugh used to discover Pluto. I couldn't get back far enough to picture the whole structure, but the astrograph he used is shown (the tube with the metal plate-holder at the end - an astrograph is simply a telescope designed purely for old-fashioned astronomical photography). It brought back memories of one of my final-year undergraduate projects when I also used an astrograph to learn about unsharp masking. I've more trips planned albeit rather vaguely. Next year I'd like to either 1) take an Amtrak train across the Rockies, 2) visit Montana or 3) drive Route 1, the Pacific Coast Highway. Any tips? This is lifted straight off the internet but I haven't found the original source. In any case, the rules all bloggers should follow! Foreign words and phases are not apropos. Use words correctly irregardless of how others use them. Understatement is always the absolute best way to put forward earth shaking ideas. Eliminate quotations. As Ralph Waldo Emerson said, “I hate quotations”. You’ve heard it once you’ve heard it a thousand times: Resist hyperbole; not one writer in a million can use it correctly. The house I bought a decade ago was advertised with the words "Wake up to the doves in the morning and the waves crashing on the Puna shore". Or something like that, I'm paraphrasing. The doves are pigeons by the way. At least that's what they look like. No matter, they make very soothing sounds in the morning. The waves crashing on the shore was a bonus, I loved that sound but can only hear it now when there's really high surf because the coquis have taken over. These little buggers, and they are little (typically about an inch long) must hold world records for the amount of noise they make. You would not believe that such a small a creature could be so loud. 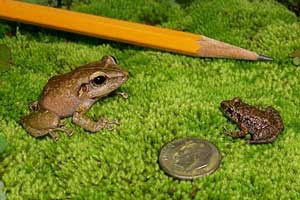 The coqui frog is not an indigenous species to Hawai`i, it got here, somehow, from Puerto Rico. It's a threat to native species because it has no natural predators here except rats and mongoose, which aren't exactly native. It's a threat to people's sanity as well. I was hoping that I lived close enough to the ocean that the salt air would deter them from infesting the area, but I was wrong. They don't like citric acid or hydrated lime because it kills them and I've tried both in my yard (legally, I might add). It's helped but there's too much jungle surrounding me and it's now a lost cause. I can now only try and control the frogs that get so close to my house that make sleep difficult. It's impossible to describe how loud these frogs are, but on my occasional coqui hunt I've got close enough to one of them without it realising and I'm not exaggerating by saying it hurt my eardrums. These 1-inch bastards are capable of a 90-100 decibel call from a metre away. How they don't deafen themselves mystifies me. or a whole bunch of them. I have a tree, about 20-feet tall, that's producing these things. 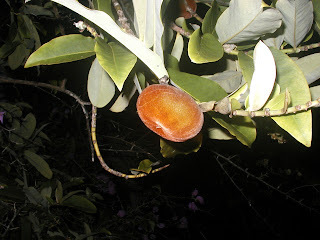 The fruit, seed, whatever, is about the size of an apple but rock hard, I need a saw to cut the thing open. It has a fury skin which is very brown. 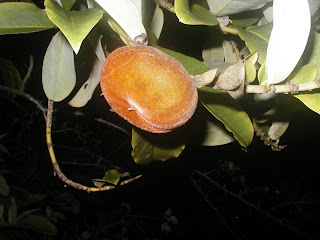 The inside, once I've sworn enough and cut the thing in half, is apple-white with no obvious seed inside. I've taken one into work, along with the stalk and leaves, and asked around but no one knows what it is, including the locals. Any clues would be appreciated. This is the 5-day forecast for Hilo from AccuWeather and what appears in the local rag. I'm convinced that the forecasters have a database of about 50 different ways of saying the same thing and they just pick them by random being careful not to repeat themselves exactly. Today I went over my finances for two reasons: 1) I need to find out how to limit the losses to my pension after the stock market crash and 2) there's a new president on the way and both of them are promising change. If Obama wins then I'm allowed to carry on with my current health plan. My employer carries on contributing as do I. It works OK but doesn't compare to the health system I grew up with; if you required emergency treatment you got it, no questions asked and no soul-destroying bill at the end of it. Three years ago, in the US, I had to have emergency treatment and it cost me nearly $6000. Fortunately I had health insurance otherwise I'd have lost my house, but have only just finished paying off the bill. With McCain's plan I'll end up having to find another $1000 a year to pay for health insurance, and that's after the so-called tax refund, with no change to out-of-pocket expenses. The only way I won't lose out is if my employer increases my wage by the amount they no longer have to pay for my insurance. I have a good employer, they might do that, but I suspect that most companies in the US will use the money they used to spend on medical benefits to recover after the recent stock market crash. The employees will lose out and we'll end up with more people without health insurance. Perhaps I'm wrong, but I've gone over the numbers several times for my own situation and I'm a little scared. There's something about astronomers and cats. 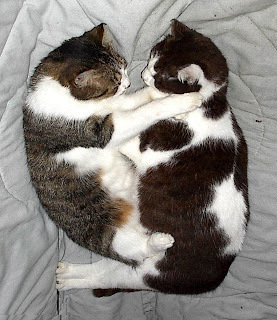 I can't quite put my finger on it but I'm convinced that if one of those election poll agencies saw fit to do a study they'd find a larger percentage of astronomers have cats compared to the public at large. 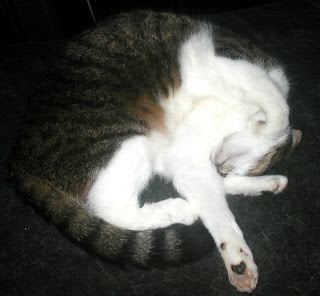 When I arrived in Hawai`i, over a decade ago now, the person I replaced (a distinguished MBE these days) had a cat. My PhD supervisor had three of them. My first office mate in Hawai`i also had three and now I find another very distinguished astronomer in the UK, Peter, is owned by Columbo. I could go on with the list but that would be boring. 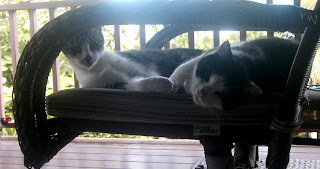 Just over 12 years ago I arrived in Hilo and shared a house with a friend of mine for almost a year - an astronomer and another cat enthusiast (I don't think I realised that until after I arrived) . At that time, and in my formative years, I loved dogs. They're great creatures: astonishingly loyal, affectionate and relatively easy to train. There's no greater pleasure than owning a well-trained dog and I didn't particularly like cats although I'd tolerate them. 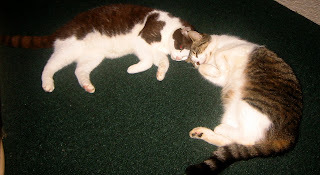 Unfortunately, dogs require high-maintenance and my house-mate convinced me to adopt a couple of cats instead. Oh boy, sometimes I regret my decision to have a small family of cats, but most of the time it's been worth it. Four of them have owned me, two I've sadly lost, but I still have Eddie who's 12 now, and Bubbles, 11. 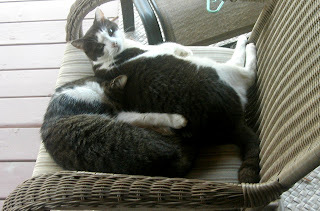 Bubbles thinks Eddie is her mother, she's not, but will follow Eddie around as much as she can which annoys Eddie. It usually ends up in a fight although they've never actually injured each other. Then they make up every night. I'd like to own a couple of dogs again one day but my lifestyle doesn't allow it. 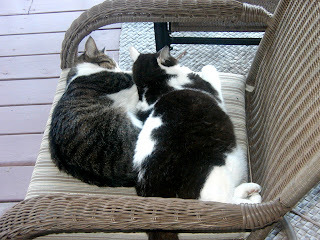 In the meantime, though, these girls provide an awful lot of entertainment and affection. They're family now. Today I was searching for something relating to dust grains in space. It sounds very uninteresting, I'm sure, but there you go. It's actually an area of research I have a little bit of expertise on though. Maybe I'll explain why in another post one day. One site popped up that I'd never seen before. I must have put something into the search terms that resulted in a link to a skeleton being found on the moon. Huh? So curiosity took over and I went there - and how I wish I hadn't. "America'a Apollo 11 lunar module photographed a human skeleton on the moon when it landed there in 1969." Apollo 11 or the skeleton? That's just one of the stories. I then went to the home page and found that there are a whole bunch of things we never knew about the moon. Or, perhaps, I didn't and I'm just out of touch. Did you know, for instance, that aliens have a moon base on the dark side of the moon? There is also a small village there as well as a secret base which is involved in some kind of mind control. Sounds as though the place is a bit too crowded for me, and to top it all the Germans went there in 1942. Now, I'm considering giving some advice to the authors of websites like this. I was going to say that you might consider concentrating on only one story or perhaps two at best. If you collect a whole bunch of really strange stuff, most of it contradictory, then dump it all on one web page some people might become suspicious that it's all codswallop. That's not the advice I would give though, but this is: don't use countless exclamation marks at the end of a sentence, it's a dead giveaway. A PLACE TO THINK!!!!!!!!!!!!!!!!!! isn't really a place to think. The third and final presidential debate ended a few hours ago and it was by far and away the most interesting of the three. I guess I'm still an outsider since I don't have a vote, so could perhaps be considered the equivalent of an independent voter, therefore have actually been listening carefully to the things the candidates have been saying. Not that I get to choose mind you, but I will be affected in the same way as any other US worker by whatever policies get enacted over the next year or two. The format was vastly improved over the previous two. Although there was still no audience participation in the way I'd love to see (why are they there in the first place? ), the moderator made up for that. Best of all, the ridiculous rules that quashed any real debate in the candidates' last squaring off were gone. This time it was two minutes each to answer a question and then a good five minutes of followup and good old fashioned argument - with some flexibility on the timing when things got interesting. Who won? I don't know. McCain had Obama on the defensive to start with but towards the end Obama came back strongly. If I were to score it on punches landed I would say McCain by a half point, but the punches were mainly jabs and didn't cause too much injury. McCain certainly scored points with his use of "Joe the Plumber", that was a good tactic, but countered towards the end by some clever policy talk on health and education by Obama. I don't understand why autism kept coming up though. This must have been something I missed in earlier campaigning. It's an awful night tonight: thick cirrus + full moon = no science and likely no discoveries. The summit tourists and astronomers would have been treated to a spectacular sunset though. 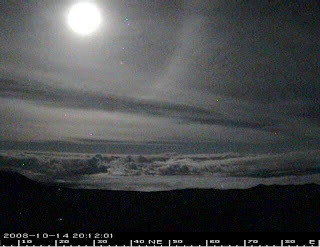 The summit of Mauna Kea must have one of the densest populations of webcams on the planet. I'm sure there are other places that rival it but in the last year or so the number of webcams has increased enormously. So has the number that can now provide images at night as well as during the day. The images (and movies) are all available from a Mauna Kea Weather Center (MKWC) page. Tonight the halo around the moon is clearly visible and that's always a bad sign for astronomers. Ice crystals in the upper-tropospheric cirrus clouds are refracting light from the moon into a beautiful ring - I can't measure it from the webcam image but it should have a radius of 22 degrees otherwise something is wrong with the atmosphere's physics tonight. It means, however, the sky isn't clear so observations of faint stars and galaxies aren't on for tonight. 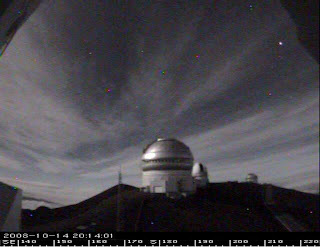 The image above is from the CFHT's webcam facing towards the north-north-east. 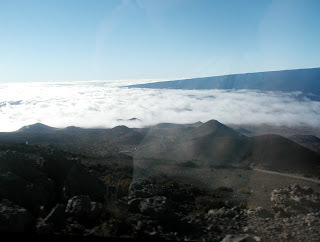 The one below is again from the CFHT, this time facing south, towards Mauna Loa. 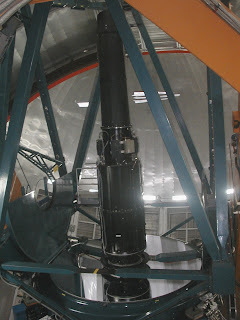 The telescopes you can see, from left to right, are Gemini North, the UH 88-inch and the UKIRT. It looks as though the slits are open and the telescopes are looking at something, but there will be a bunch of frustrated scientists inside those domes tonight. Lou Minatti is a long-time online friend and excellent blogger. This evening he posted a photograph from Wally Pacholka. I do not have enough words to describe how beautiful this image of the Milky Way is. I'm speechless. How I wonder how many of you little buggers are out there? Poetry was never my strong suit. Although there have been several surveys of the astronomical sky in the past we're entering a new era in astronomy fuelled by the incredible increases in the processing power of computers. At least three telescopes on Mauna Kea are undertaking sky surveys or are about to and one of these is the UKIRT Infrared Deep Sky Survey (UKIDSS), an ambitious attempt to map the northern hemisphere sky in the near-infrared (light with wavelengths of roughly 0.8 to 2.3 microns) . The survey itself consists of five sub-surveys, the Large Area Survey (LAS), the Galactic Plane Survey (GPS), the Galactic Clusters Survey (GCS), the Deep Extragalactic Survey (DXS) and the Ultradeep Survey (UDS). Although all these surveys use the same telescope and instrument (UKIRT and WFCAM respectively), their aims are very different. The main difference between them though, in lay person's terms, are the parts of the sky they cover and how deep the images go and therefore the science we learn. For instance, the LAS is a project to map a large part of the northern hemisphere but not as deep, for instance, as the UDS which images a part of the sky only slightly larger than the apparent size of the full moon, but spends almost a year doing so. These images will be added together to create infrared images of the early universe. As a very young child my interest in the physical sciences was given to me by my father (a meteorologist) although I never actually thought astronomy would be my career - that came a lot later. Every week I'd sit with him and watch Star Trek and then I'd look at the astronomy picture books I had been given by my parents and neighbours. The images that always held my attention were those of stars in nebulae with all those amazing colours. I used to imagine that there were planets around those stars with populations that would visit each other in their space ships. What I couldn't imagine then was how far we would advance and produce images that now blow my mind. I still love images of nebulae, they always make me pause for thought, and my favourite survey for this is the UKIDSS GPS. 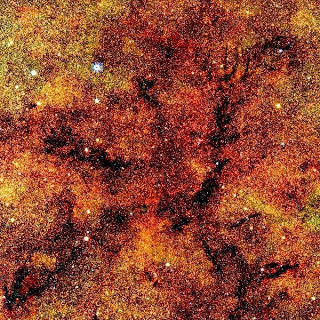 They've released some of their images to the public (e.g., the picture above is the GPS image of our Galactic Centre) and you can get a glimpse of our Galaxy in the near-infrared for yourself at the GPS WFCAM Science Archive page. And before you ask, no, I'm not a fan of Star Trek! A few weeks ago the news was all about the Large Hadron Collider (LHC), the highest energy particle collider ever built, and whether the world would end or not in a mad-scientist's attempt to recreate the Big Bang and have us all sucked into a black hole. Or, as the scientists would say, we would learn some new physics. The mad-bankers have since become jealous and are currently doing their best to end the world themselves. Blessed are the poor financial experts, they know not what they do. The LHC is broken and never even got to the stage of colliding protons, but it will do next year. Hopefully. That's enough time to schedule the rest of us to put the sub-prime mortgage lenders in the beam, handcuffed and blindfolded, and let them see what the end of the world looks like. As an experimentalist, I would like to see what happens. I'm off for another sleep-deprived stay at Vacation Resort Hale Pohaku although this will be a relatively short stay, at least I hope so. I thought anyone reading this might be interested to watch the following very well made video on youtube which provides a sample of life on the mountain for a group of extremely talented astronomer-musicians. I happened to be on the mountain when this video was made. It was the first time I've ever sat down for breakfast and dinner at HP with live guitar music, it definitely felt a little different! Despite the somewhat depressing times everyone is experiencing right now we're still making some fantastic scientific discoveries. The NASA MESSENGER probe has taken some stunning images of Mercury, the planet closest to the Sun and definitely one of the least understood planets in the solar system. Mercury is a mystery but is also one of the keys to confirming Einstein's theory of relativity. Its odd orbit wasn't understood until general relativity explained it. A high five to Albert. OK, so it looks a bit like the Moon. I guess it does. This planet hasn't been imaged for decades though, at least not this close, and scientists are going to learn quite a lot about our solar system from this mission. I'm no planetary scientist but can't help thinking that Mercury took quite a smack from something large in its youth, just look at the northern polar region. 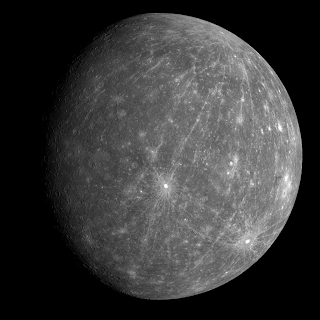 In fact several groups think a giant impact is what created Mercury in the first place (just like our moon), but the scar from that wouldn't be visible on the planet, so am looking forward to finding out exactly what the experts think. This is an amazing time in planetary science, both NASA and ESA are making tremendous discoveries about our solar system and nearest planets. Water is confirmed on Mars and who knows, maybe we'll find out if life existed there or, heavens above, might still be there. And all this costs poodle piss compared to the money lost by Wall Street. I really wanted to avoid talking about politics in my blog but it seems that I'm compelled to post something every time there's a debate! So I won't mention any politics this time or give my opinion on the candidates, but instead mention how disappointed I am with the forum, again. I'm watching the debate right now being replayed on local TV because, of course, there's quite a time-difference between here and the mainland so missed the actual live debate. This is the so-called town hall debate and my impression was that the audience would play more of a role. Oh well, this is a feeling I know well, but - Wrong Again. OK, some of the audience were given an opportunity to ask a question, but I feel dissatisfied. There were too many questions and not enough time to debate the answers. Having such a debate is a great idea and giving the candidates about two minutes to introduce their position works well, but how about limiting the questions to a few of the most important ones and then allowing more time for actual debate? Perhaps even an opportunity for the audience member asking the original question to ask something or make their own point as a follow-up? For anyone reading this blog with knowledge of this debating system, could you tell me what rules to expect in the final presidential debate? I hope Obama and McCain are allowed more time to argue their points, and I really mean argue, and that the audience can participate more. I just feel a bit let down right now. In the old days, life as an astronomer was wonderful as long as you enjoyed travelling. Every six months or so you'd write science cases for obtaining observing time at various telescopes around the world and if the various peer-review panels accepted your proposal, off you'd go to the telescope to carry out your project. As a student and subsequent post-doc I was fortunate enough to visit the US (including Hawai`i), Australia and South Africa to use various telescopes. Although this still happens many observatories are switching to a new mode which is far more efficient. I just happen to work at one which took the lead in this new method - queue observing. The old "classical" scheduled runs worked well because you were at the telescope and essentially controlled your experiment, but if your run happened to coincide with a period of poor weather or serious technical problems then you were almost certainly screwed. The new mode is called "queue scheduling" or "flexible scheduling". Briefly, once the time allocation panel approves a proposal for telescope time the astronomer prepares his or her programme using software supplied by the observatory and then submits it to a database, or the "queue". At night, these programmes are pulled out of the queue and run. The astronomer then receives their data via the internet. The advantages are numerous. The various science project in the queue will more often than not have particular weather-based requirements. For instance the seeing needs to be good in order increase sensitivity or detect small detail in images or the observations require dry atmospheric conditions. Alternatively some observations can be done in bad weather because sensitivity or stable conditions are not so important. Which observations are done on a particular night are then driven by the weather and we no longer have nights wasted because of inflexibility. The database also allows those projects which are rated highly on a scientific basis to be put at the top of the queue and so are given the best chance of being completed. This has reduced the need for astronomers to travel to observatories. Some love this, others don't! It hasn't completely removed the need for visiting observers though and we still receive many of them. For the more technically challenging projects or highest rated projects astronomers still visit and their project is given priority while they're observing. They still get to carry out their experiment but while conditions are not suitable for their project they carry out observations from the queue for others. When visiting observers aren't present then of course the observatory staff do the observing. It's a win-win situation as far as I can see. Money is saved, the best projects are almost certain of being completed, we can still train visiting students and the highest quality data are almost certainly guaranteed for those that need that. If I were still in the UK though I might think differently as I adored travelling, I still do in fact! Well, I guess it would have forced me to write better proposals! ...a meltdown at the summit when the server went down and broke everything: telescope, instruments, sanity, but unfortunately not the phone system as well. Several people were called. This was 3 o'clock on a Sunday morning. Some of us are used to this though but it's never pleasant. Today I planned to watch a bit of football (the American kind) but found myself at work instead. We're back in business again otherwise I wouldn't be writing this, but needed a bit of a distraction this evening because I was annoyed and frustrated. So I visited Borders on the way home and bought the 4th season of Boston Legal. I'm a bit of a BBC fan as I love British television and (usually) hate American TV. Well, tonight I've laughed as I haven't done for a long time and actually cried as well, all within 30 minutes. I can't say enough good things about Boston Legal apart from it's the most intelligent and funny series I've seen in years. It's a shame season 5 will be its last and will buy that season the next time my weekend is destroyed - well, as soon as the series is finished and the DVD is available. Another brief sortie into politics: the US vice presidential debate today was not what I expected. I like the idea of these debates but don't like the fact that the audience cannot participate. What I disliked even more about this particular debate was the moderator's almost machine-gun-like questions. There seemed to be little time for the candidates to answer questions without having to ensure that their sound-bites were there for the press and not much more. Fewer questions with an opportunity to encourage the candidates to provide more in-depth answers would have been my choice, but I don't have a say and may well be in the minority anyway. It was interesting nevertheless. Voting eludes me in the upcoming election, I'm not yet a US citizen. Hopefully I can have a say in the next election and when that happens I know I'll be listening to the debates with even more interest. The candidate for whom I'll vote is something I will decide then, but what I'll be hoping for is someone who actually answers the questions. During this debate I think Biden actually addressed most of the questions pertinently whilst Palin often tried to steer the debate to the areas that she felt she could score points even if they were utterly irrelevant to the question asked. My perception was that those areas were very limited. Update (21:50 HST): The debate was shown again here this evening and it confirmed something I thought I might have misheard from Palin. "It's a toxic mess, really, on Main Street that's affecting Wall Street." I felt insulted when I first heard it, now that I've heard it again I'm more insulted. This is why I think there should be audience participation because I doubt that's what she meant and it would have been relatively easy for someone to question her about this comment. Without that opportunity though, I now feel as if she blames someone like me, an average tax payer, for the Wall Street meltdown. I had nothing to do with it your honour. For those who might not know, I'm not a US citizen but pay taxes to the US government just like any other US worker. I just don't have any representation. I can live with that for now. It should be drummed into me by now but I never remember, perhaps because I'm either on the mountain, at work in Hilo in a relatively sound-proof building or at home, my ear-drums being destroyed by the infestation of coqui frogs. Or perhaps I'm just getting older. Yesterday, however, I took an early lunch break and was walking right under one of the Hawai`i Civil Defense sirens when it went off. Boy, did my heart miss a couple of beats or what? Those things are loud. What I'd forgotten, again, is that on the first weekday of every month the sirens are tested along with the early warning system for broadcast media. The sirens are used to warn people of an emergency such as a hurricane, but everyone here is more familiar with their use to warn of a tsunami. Everyone remembers the Indian Ocean tsunami in 2004 that killed hundreds of thousands of people; perhaps fewer remember the tsunamis that killed more people in Hawai`i in the 20th century than all the other Hawai`ian natural disasters and that concerns me. The population on this island has increased by an incredible amount in the last few years and people are building houses right on the coastline. Many of these families are from the mainland and might not be as aware of the tsunami threat as the locals, but even people that have lived here all their lives may not have experienced a large tsunami as the last big one was nearly 50 years ago. Hawai`i is quite unique when it comes to the threat as it lies in the centre of the "Ring of Fire" and is subject to tsunamis generated from anywhere in the Pacific. Fortunately there is now a rather sophisticated early warning system but it will do little to help if the tsunami is generated locally. In that case we'll have only minutes to react. 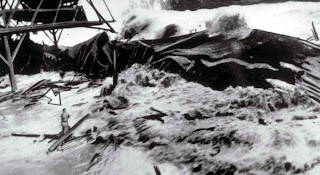 The picture above (credit: NOAA) is of the first waves crashing into Hilo harbor during the 1946 event. The arrow points to a man who didn't survive. This will happen again one day, I just hope people living here realise that.